Has predstavio VF-18 bolid, prva ekipa koja je pokazala ovogodišnji bolid javnosti! 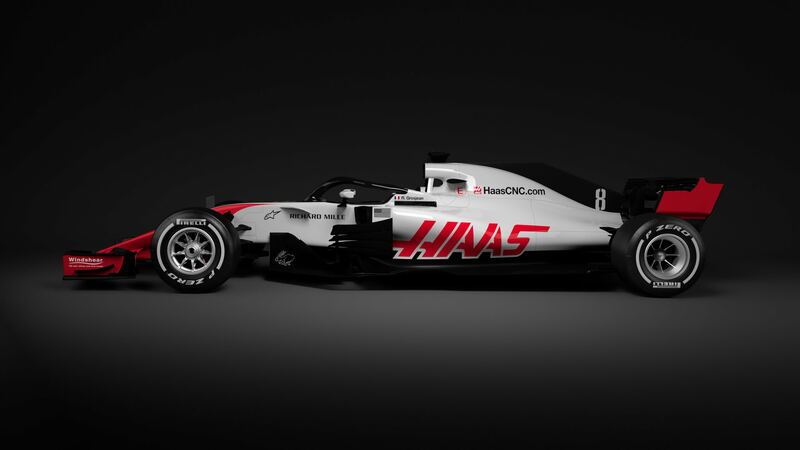 Haas has become the first team to reveal its car for the 2018 F1 season. The VF-18 was revealed without warning on social media, making the American team the first to reveal images of its new racer. The renderings reveal little detail of the new car. The most striking change for 2018 – the addition of the Halo – is largely obscured by a dark background. The car also lacks a shark fin, which has been cut back in the 2018 regulations. Vrlo interesantan bolid, kao i lane izgleda kao jeftina kopija prošlosezonskih Ferarija ali to može značiti samo jedno- napad na sredinu poretka! Širok i plitak usisnih vazduha za motor je tako uražen verovatno zbog oreola ali i zbog boljeg hlađenja, širok raspon retrovizora je evidentan. Opet zbog oreola. Usisnih hladnjaka na bokovima je urađen po Ferarijevom principu iz prošle sezone no ovo ovde je mnogo radikalnije i ekstremnije urađeno. Ekstremno rešenje zakrilaca uspravnog deflektora, videlo se da nisu džabalebarili tokom zime! T krilo je prisutno, ali samo donje izdanje pošto je gornje zabranjeno uz ajkulino peraje. Edited by /13/Ален Шмит/, 14 February 2018 - 17:22. Has najavljuje da sutra nece testirati ako se vreme ne popravi. INSIGHT: What does Haas' U.S. base actually do? Over the past two weeks, virtually all eyes in Formula 1 have been on Barcelona. The 2018 cars have been running for the first time (when weather allows), and observers have been trying to work out pre-season form guides. But while the paddock in Spain has been a hive of activity, there has been a similar buzz back at the factories of all 10 teams as the first data from track running comes back after months of preparation. In North America, you can be forgiven for feeling a little detached from the action. All of the teams have bases in Europe, and that's where testing takes place before the first race in Australia. But a crucial part of car development has been - and still is - going on in North Carolina. As the home of Stewart-Haas Racing, Kannapolis also became Haas F1's headquarters when the team announced its entry to the sport back in 2014. Over the two years that followed before its race debut, Haas established bases in Italy and the UK to be nearer F1's heartland, but some facilities remain in the US. At this time of year, the most significant of Haas's American-based department is computational fluid dynamics, better known as CFD. Alongside the Ferrari wind tunnel, it is the main simulation tool for Haas to use for development before it goes track testing, and its CFD team has been busy for nearly a year on the 2018 car. "There are some core architectural issues that we start to tackle even as early as March of the year before," chief aerodynamicist Ben Agathangelou tells RACER. "As soon as the car runs, we'll start thinking about what we think we can improve - based on our own observations and maybe looking at what other people have done - pretty early on, because anything that has a major architectural impact on chassis design or cooling installations needs a lot of foreplanning. 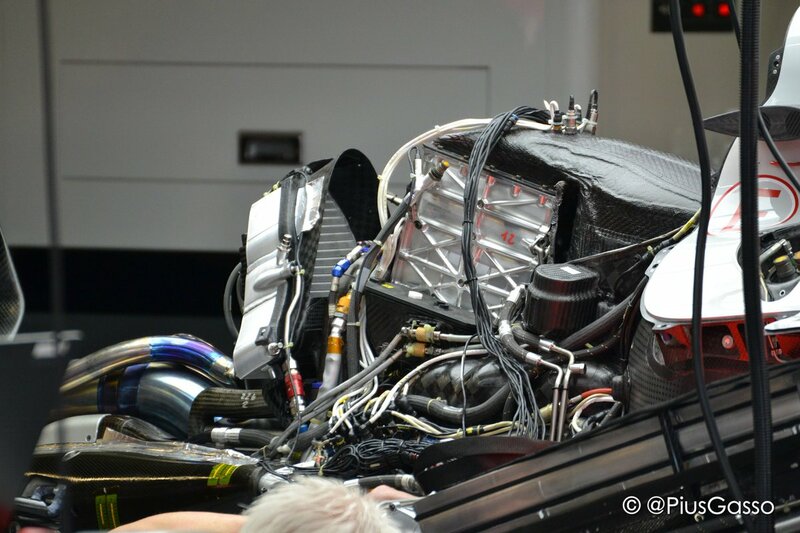 "For a team like Haas, there's a practicality that has to be applied to producing stuff that has an overhead of time. So this car was defined, and let's say 'frozen', starting as early as early October for certain components - things that have crash dependencies and what-have-you. "Chassis was probably late September, early October, and then the final definitions - so floor, bodywork, addenda - will have been as late as just before Christmas. So it's quite a long release process, and it's probably a little bit longer than a more established team, but that's kind of where some of the economies come from in terms of being efficient with the thought process and the planning that allows us to do so. "So that means the car that we're running now is actually - in development terms - nearly three months old. And that makes a big difference in this world, so now we're thinking, how are we going to get the next lot on?" The two areas of aerodynamic development are complementary, with CFD and the wind tunnel work going hand-in-hand. Having an ocean separating the two halves of the department is a challenge but one Haas was willing to take on, and the team is now able to tap into a unique talent pool as a result. 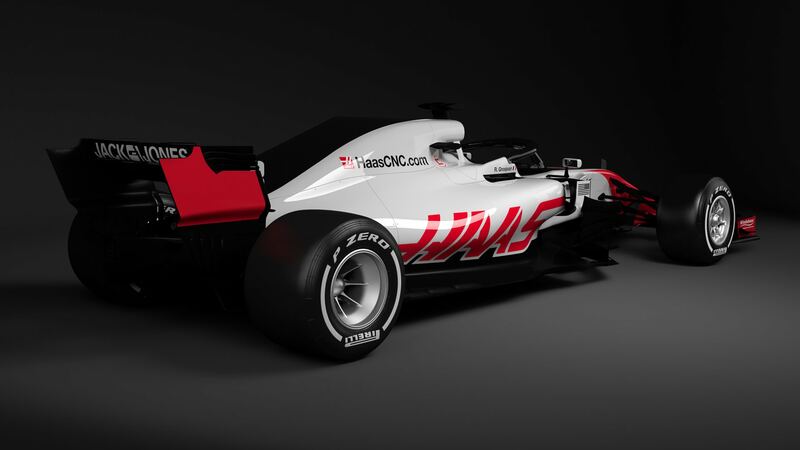 "The negatives are that we aren't co-located with the aerodynamicists, [which] would be the ideal situation," says Charles Jenckes, Haas F1 CFD aerodynamicist and team leader. "But the positives are that we're a key technology group that's located in the U.S., which gives us a U.S. presence for the team where really the rest of the technical aspects of the team are not in the U.S. at all. "We're also changing the dynamics of our group to minimize the negative aspects and enhance the positives. For example, ideally the aerodynamicists would be co-located with the CFD engineers, but we're creating a level of automation for our process that minimizes the need for CFD engineers. "So the U.S. group will predominantly be doing process advancements like working with turbulence models and working with coding to increase the efficiency of our CFD ops, as opposed to running cases for the aerodynamicists. We'll no longer have people running cases – the aeros will run their own cases, so we've created a huge step in efficiency improvement. "What we have in the United States that arguably is even better than what's in Europe is a university network that has outstanding research in CFD. We have some of the best universities in the world for that, and we can reach out and connect with these universities. We are doing that. "Places like Princeton, MIT, Stanford, Caltech - we're going to have direct relationships with these universities that is going to be much easier by being here [in the States]. So what we're doing is maximizing the value of the group that's in the U.S., and playing to our strengths and removing the non-value-added work like having CFD engineers running cases in the U.S. instead of running them in Europe." Agathangelou has extensive F1 experience from having previously worked for the likes of McLaren, Red Bull and Ferrari, and he admits he had his doubts about the Haas set-up when it was first conceived. Now, he has no such concerns. 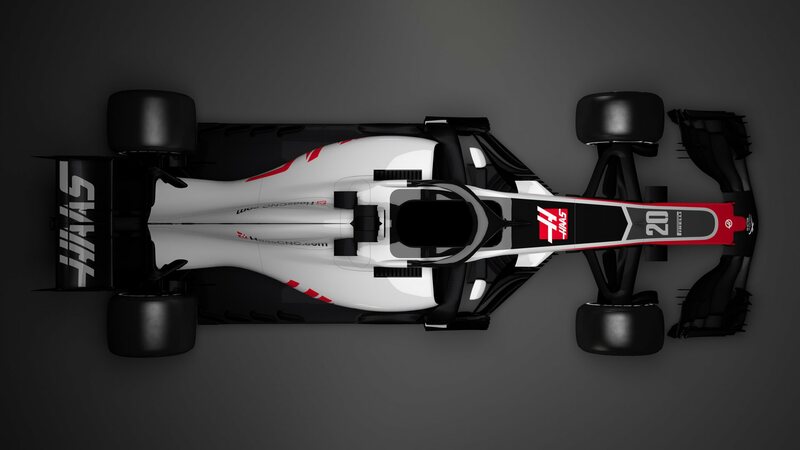 With Haas estimating about 70 percent of the car will be replaced by mid-season based on what is currently in the development system, trust in the CFD department is crucial, because that technology react more quickly than a wind tunnel to issues that arise in testing. "We're always looking at the correlation between CFD and on-track," Jenckes explains. "For example, after the first test one of the things that we always revisit is cooling. And the reason is that cooling has a profound impact on external aerodynamic performance. The more cooling that you have to have, essentially the more losses that you have - the less downforce and the more drag you have. "So we always want to be able to use CFD as a tool to predict cooling effectively, and in the first test every year, because of the power unit changes, we have to verify that all the models - the heat rejection models, the CFD for the airflow through the heat exchangers - are revisited every time that there's a test, and especially at the beginning of the year. "That's just one example of how we immediately react to what went on in the first week of testing. Even though the temperatures [in Barcelona] were really out of bounds for normal operation, it was still good data that we got and we're immediately responding to that data." Successfully establishing and managing the relationship between the U.S. and European bases requires both patience and experience, and Remy Saffar works out of Kannapolis after having previously been with Oreca's LMP1 projects. Having moved from Europe, the CFD engineer highlights effective communication as central to making the Haas set-up work. "I established CFD departments with my co-workers and managers at Oreca," Saffar explains. "So I was able to see the whole chain from writing a code, drawing a part, seeing this part being tested on the race track and how to pick up the data from the race track. "Since I've been in Kannapolis, I've been able to bring this vision and the methods I learned in order to help Haas to improve their methods and go faster in our development by streamlining the processes. "We work significant hours, so it means when I am in the design office, it's the same environment that it would be in Europe. It's still a high-pressure environment, because we have to deliver results pretty fast. "So the things we have to manage are our interactions with the engineers in Italy, where there is a time difference of six hours. It means sometimes the communication can be difficult, and that's why we had to implement some strict processes and methods in order to avoid any miscommunications between the engineers there and us here. "It has been a big challenge, but now it works pretty well and we are able to perfectly communicate through the processes that have been implemented here." As testing draws to a close, the team's new VF18 will return to Banbury, aerodynamicists will head back to Italy and the CFD department will turn its full attentions to the next wave of in-season updates. However, for Agathangelou, as much as the car itself, the U.S. base holds significant development potential. "Getting people with F1 experience has probably been the most difficult part at Kannapolis," he says. "The subtleties of F1 are the subtleties of F1, so that needed a lot of investment from me and my colleagues to spend a lot more value time in the U.S., and time when the guys over there are in the main design group in Italy, to allow that to evolve. "Now, three years on, we've got some people who have got some good F1 experience over there. So it was an investment and it was a lag, but you pick the right guys and they get there. The real talent, and the real thing that I'm seeking from the U.S. group, is that connection to the future and how CFD evolves." Kevin Magnussen says Haas needs to improve the speed at which it delivers new parts to its car regardless of where it starts the season at this weekend's Australian Grand Prix. 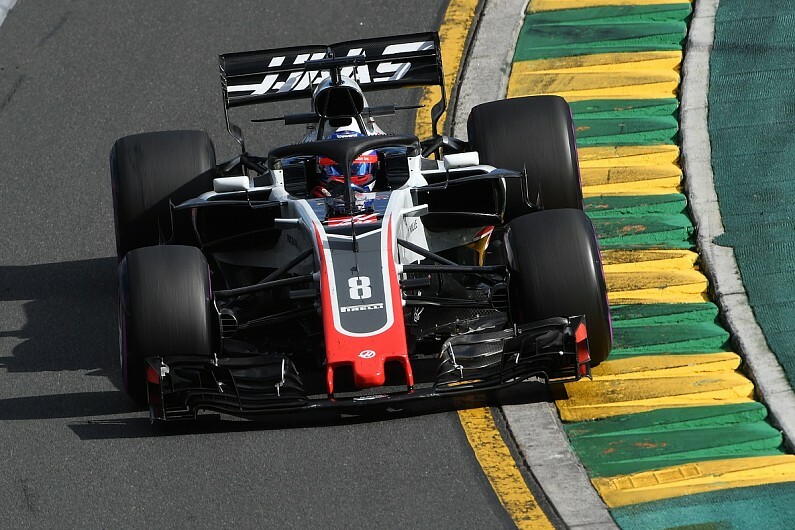 Haas impressed during pre-season testing and is expected to be in the mix for best of the rest behind Mercedes, Ferrari and Red Bull when the new season gets underway in Melbourne. While two rivals for fourth in the constructors' championship – Renault and McLaren – suffered some reliability issues during testing in Barcelona, Magnussen doesn't see the opening races as a bigger opportunity for Haas and says it most focus on increasing its rate of car improvement. "I don't see why our competitors wouldn't be as ready as us," Magnussen (pictured above) said. "Of all the teams we have the least amount of resources and capacity, so we shouldn't be the best prepared of all the teams. It should be the other way, naturally. We feel really prepared and we feel ready to go racing with our car. But how it's going to go in the year, how it's going to develop over the year, it's hard to say. "One of the things we need to improve is bringing the stuff we design quicker and earlier. At the moment it takes us longer to produce the parts than other teams. That's an area that we are working on and area that we need to expand and grow." Magnussen sees this year's development race as particularly crucial because he is expecting an extremely tight battle between a number of midfield teams. "I think it's going to be a very close fight between McLaren, Renault, probably still Force India, Toro Rosso. Hard to say where Williams is but they are probably going to be in there as well at some point and then hopefully ourselves." While Guenther Steiner says its is presumptuous to place Haas in a battle with the likes of Renault and McLaren, the team principal remains confident in its development plan. "We have a good plan in place, but I don't know what the other ones are planning to put in, so it's difficult for me. We can go with history. Even spending a lot of money doesn't mean all the time you get the result of it. Even if they spent $10 million or $20 million in updates, that doesn't mean they get for every million five points in aero efficiency. "We've got a good plan in place compared to last year to bring more and better updates, because our group – we have matured as a team. If we can keep up – or hopefully we can get ahead of them – I don't know sitting here." Kad se setim Manora, Katerhama ili kak su se vec zvali, pa to je bio cist cirkus. Hass je hit mada mislim da nije toliko medijski propracen njhov uspeh. Manor i ostatak cirkusa su usli u F1 uz obecanja Mozlija da ce FIA ograniciti budzete na $40 miliona. S obzirom da to nije ispunjeno dobro su jos i izgurali. Has je otpocetka Ferari B-tim, bolid im pravi Dalara a od Ferarija dobijaju sve sto se moze dobiti. Otprilike isti odnos kao RBR i STR. Force India and McLaren want the Haas Formula 1 team's technical relationship with Ferrari investigated after its "magic" Australian Grand Prix performance. 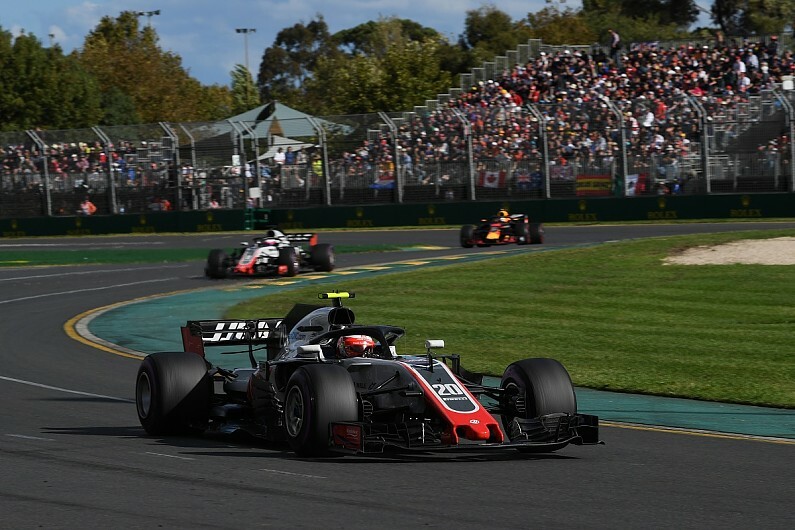 Haas locked out the third row of the grid in qualifying for the season-opener in Melbourne and ran fourth and fifth ahead of Red Bull before pitstop mistakes condemned Kevin Magnussen and Romain Grosjean to retirement. 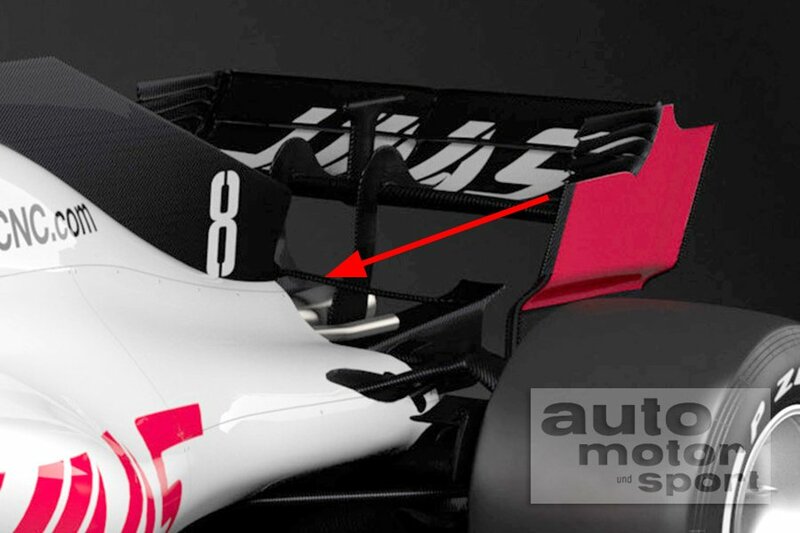 It triggered fresh questions over Haas's working relationship with Ferrari, which supplies the team with parts it does not need to build itself but also allows Dallara, Haas's chassis partner, to use its windtunnel. F1's sporting regulations strictly forbid the passing on or receiving of information on parts teams are supposed to produce themselves, a move also designed to stop personnel being rotated between projects. Force India chief operating officer Otmar Szafnauer wants the application of those restrictions discussed in the next meeting of F1's Strategy Group. "I don't know how they do it, it's magic," he said. "It's never been done before in Formula 1. "I just don't know how it can be right that someone who's been in the sport for a couple of years with no resource could produce a car... does it happen by magic? "If it does, I want the wand." McLaren driver Fernando Alonso labelled the 2018 Haas a "Ferrari replica" in Melbourne, and his team's executive director Zak Brown told Autosport it was "something that needs to be looked at closely". Grosjean said the use of Ferrari's front suspension, which the regulations allow, would naturally dictate the major aerodynamic design points because of the way the air flows over the rest of the car. Brown admitted "I don't have any evidence" to suggest Haas was not operating within the rules, but said: "We all know they have a very close alliance with Ferrari and I think we just need to make sure it's not too close. "There could be some influence, there's certainly some parts of the car that look very similar to last year's car. "But that's for the engineers and the FIA to look at more closely." Brown and Szafnauer both said multiple teams would support a clarification over the Ferrari/Haas arrangement. Szafnauer said he wanted the FIA to explain the process for ensuring the guidelines were being respected. "All the aerodynamic surfaces have to be your own," he said. "If they're not, I don't know how you can tell unless you start investigating. "Scrutineering only tells you that it fits within the boxes of the regulations. "Is it yours or somebody else's [idea]? That's the real question. And I don't know the answer to that. "Maybe it is their own, it's just suspect - how can you gain that knowledge without history and the right tools and people?" Asked by Autosport about the Ferrari comments earlier in the weekend, Steiner said: "We have a team that can be proud of what it is achieving at the moment. "We are not doing anything we shouldn't be doing or not allowed to do." "They're using last year's Ferrari," said Force India deputy boss Bob Fernley. Force India technical boss Andy Green agrees, but says it is the exchange of information between Haas and Ferrari that is more worrying. "Nobody can tell me that they don't communicate with each other to develop and solve problems faster," he said. "Under the bodywork of the Haas car, it's 100 percent a Ferrari," McLaren F1 team boss Eric Boullier told France's Auto Hebdo. "They don't build a car, they buy one. And when you buy from Maranello, it can't be bad." Znači možemo očekivati Magnusenovu/Grožanovu pobedu po receptu a la Fetel Monca 2008. Ovo s Hasom mi vraća strašne flashbackove iz vremena RB/TR pre 10 godina. Od tada FIA je nekako zabranila ovakve manipulacije no izgleda da je Has pronašao loophole. Istini za volju drago mi je zbog Hasa, nova ekipa koja rastura veliku bandu preko velikog banditosa. Kad se samo setim Virdžina/Keterhema/Hispanije/Lotus Rejsinga muka me vata. Boldovano: zar nije Has pobeđivao u NASKARu na sličan način. Negde sam čitao o tome i ne mogu se setiti detalja..